A FIFTH totem (railway station sign to non-railway enthusiasts) now adorns the wall at Nantwich's Railway Station. It is the In Bloom 2013 award from the Best Kept Stations awards, which the Nantwich in Bloom Committee is the first to win. (Awards ceremony here). “Once again Nantwich Railway Station has come up proud for the town. This is all due to the work of the members of the Nantwich in Bloom and a former Chairman, Doug Butterill, who must be mentioned. He made this a one-man mission to bring Nantwich back into modern times. Cllr John Lewis, Nantwich Town Mayor, said: “I can only second that as Mayor. I think there has been some excellent work by Nantwich in Bloom and all the people involved, and particularly Doug Butterill as Chairman. It is nice to remember him and the good work he did. ”We should thank Arriva Trains Wales who this year donated the bulbs to us. We ordered probably 200 to 300 bulbs. As you can see, the beds are looking marvellous. Above: The Town Mayor of Nantwich (Cllr John Lewis, third left) and the Chairman of Nantwich in Bloom (Tom Deans; fourth left) after the unveiling of the new In Bloom award. Also pictured (Nantwich in Bloom Committee members unless otherwise identified) are: Connie Jones (left), Margaret Lavin (right of Tom Deans), David Lind, Mark Betteley (Deputy Chairman), Jean Hallam, and Sue Hughes (Secretary, far right). Mrs Pauline Lewis (Mayor's Consort) is second left and the Nantwich Station Manager, Shelley Hall, is second right. 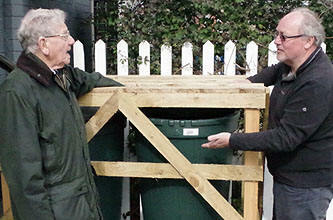 Above: Chairman, Tom Deans, and Vice-Chairman, Mark Betteley, discuss the water butts supplied and financed by Arriva Trains Wales. 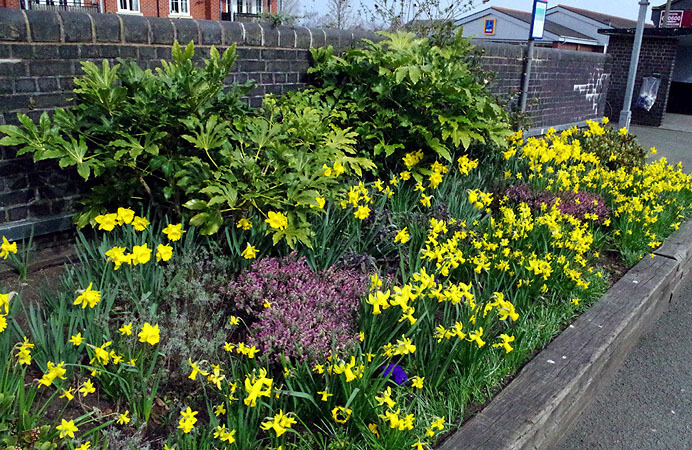 Left: Some of the 200 to 300 bulbs provided by Arriva Trains Wales for the station's raised flower beds and planters.